You Save: $19.96 (80%) Ships in 1 day. Soft Cover, 384 pages, 7.5 x 9. No ordinary collection of must-taste beers, A Beer a Day looks to unearth the links between beer and the world we live in�our history, traditions, customs, and culture. Readers are guided through the maze of labels, selecting beers that don't just taste great, but also have a story to tell. 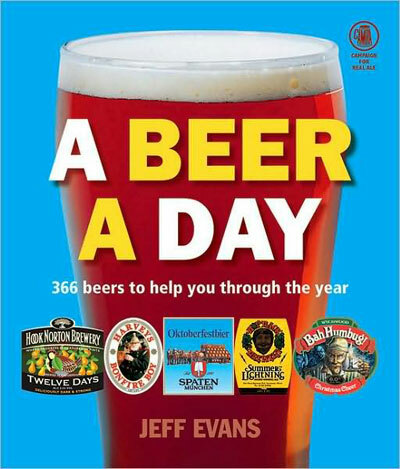 The simple page-a-day diary format includes an easy reference for the beer, its country of origin, the day's date, and its linked event. For each day, a beer is recommended that draws attention to events that have taken place or that still take place on that day. From seasonal beers produced to celebrate such occasions as Valentine's Day and Halloween, to those honoring the good and the great from history, A Beer a Day has a beer for every story and a story for every beer. Jeff Evans is an internationally renowned beer writer. He is the author of The Book of Beer Knowledge and The Good Bottled Beer Guide, a resident beer taster for both All About Beer and Beers of the World magazines, and was judged "Beer Writer of the Year" by the British Guild of Beer Writers.